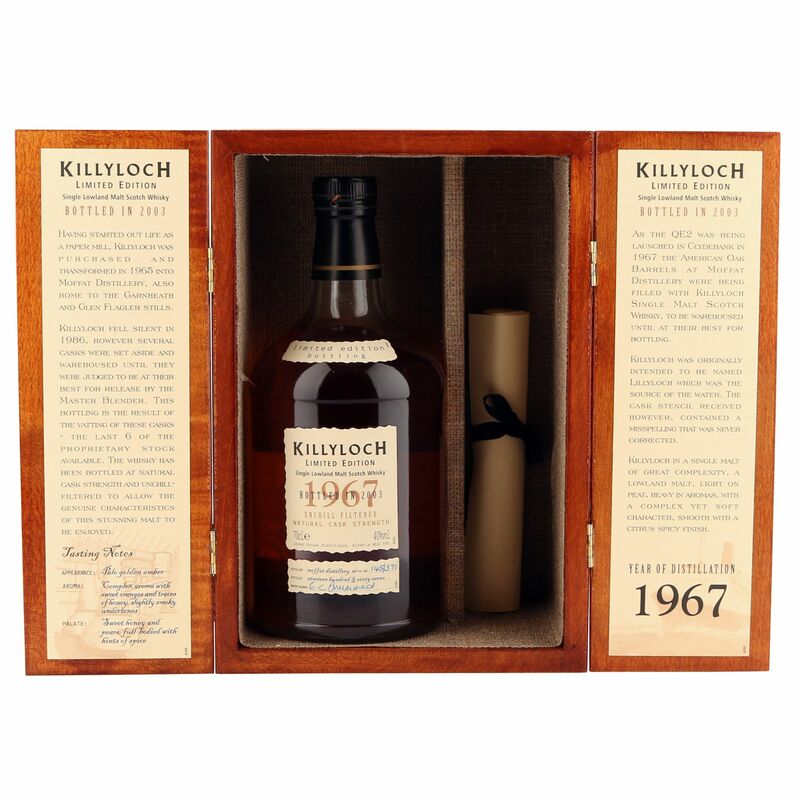 This extremely rare 36 year old Lowland single malt was laid down at the Killyloch distillery in 1967 and bottled in 2003 as a vatting of the last ever six casks from the proprietary stock. Yielded at a natural cask strength 40% ABV, this is one of just 371 highly collectible bottlings that comes complete with lovely solid oak presentation case and COA scroll insert with tasting notes. Killyloch single malt whisky was first produced in 1965, when it was distilled along side Glenflagler within the Moffat grain distillery. Both Killyloch and Glenflagler were produced using separate sets of stills within the distillery and were used predominantly for blended whisky - which goes some way to explaining why this example of a single malt Killyloch is so highly sought after and increasingly rare. All the Moffat stills had fallen silent by 1986, though Killyloch had already long since ceased production in the early 1970's, and the whole site was eventually bulldozed in 1988. 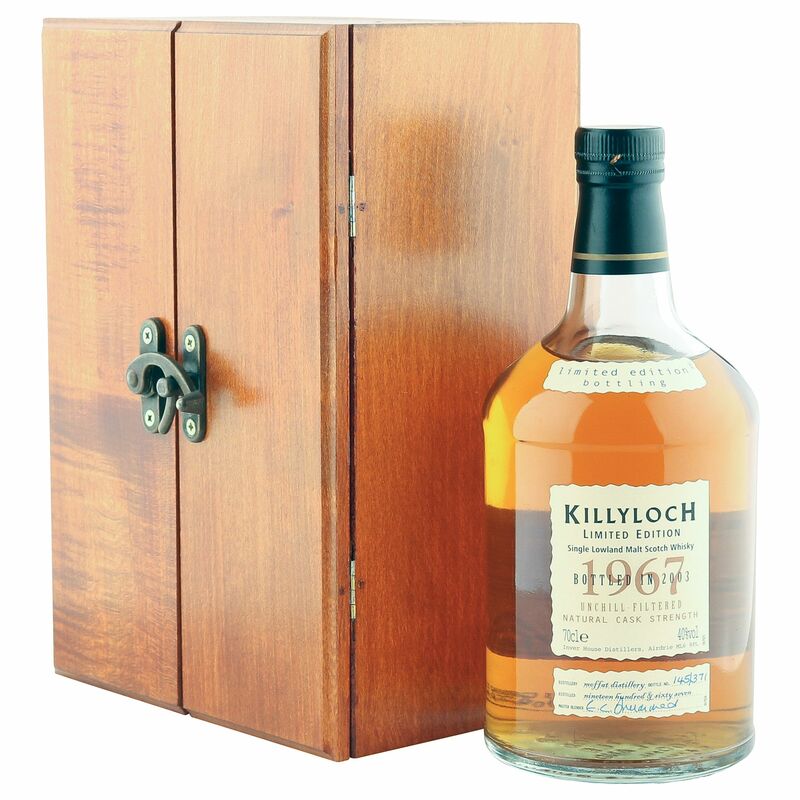 Interestingly, Killyloch was originally going to be called Lillyloch after its water source, but a mistake on the label stencils saw it amusingly renamed Killyloch ...and the rest is history, as they say.